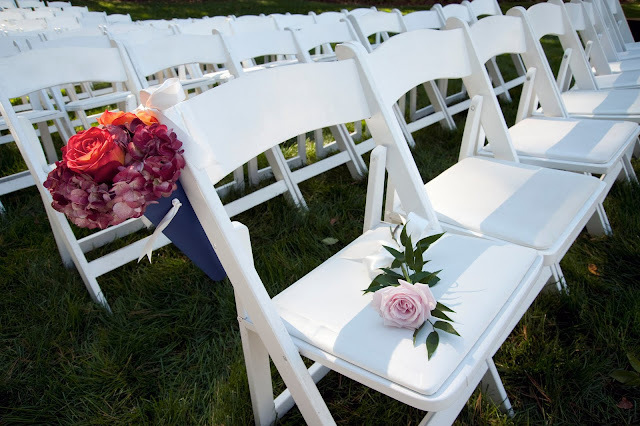 While working on Maggie and Robert’s wedding, we had the opportunity to get to know not only the Bride and Groom, but many members of their families as well! 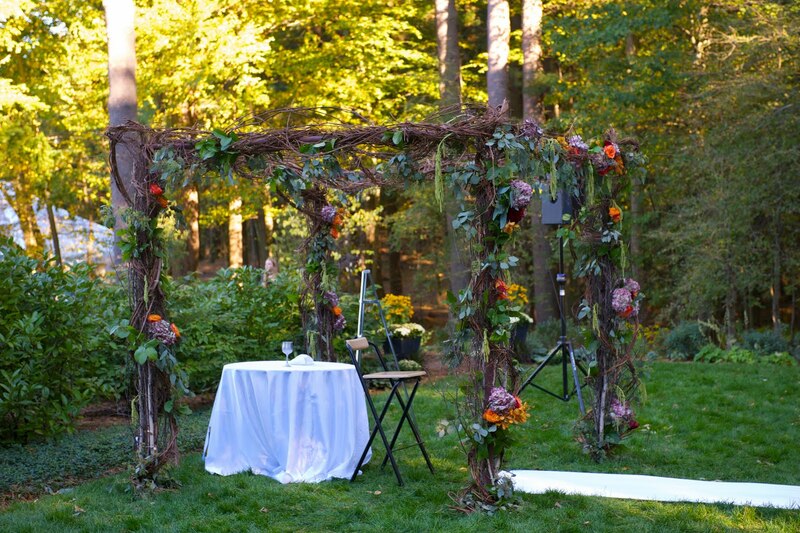 The event took place on an already stunning private estate of the Bride's parents in Sudbury, MA, but the transformation that all of the vendors worked together to achieve brought the property to an elevated level more than worthy of this joyous occasion. The celebration took place at the beginning of Fall, and from a floral perspective we used a variety of colors and textures that coincided with this season. 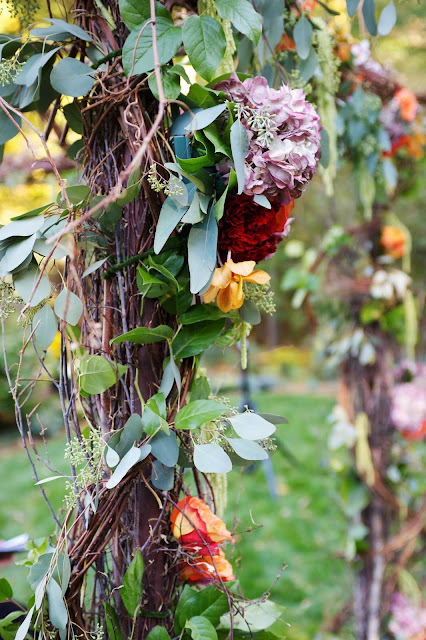 The outdoor ceremony took place in the lush green yard of the estate, where a Chuppah made of Birch, twisted Grape Vine, Hydrangea, Roses, Seeded Eucalyptus, Magnolia leaves, Dahlias, and Mokara Orchids. 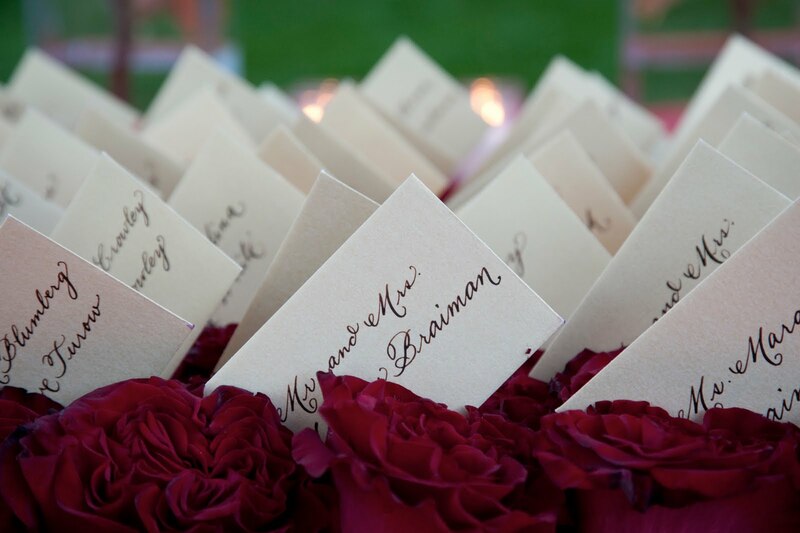 Guests sat in rows of white chairs with navy blue aisle markers,arranged in cones filled with burgundy Hydrangea and burnt orange Roses. 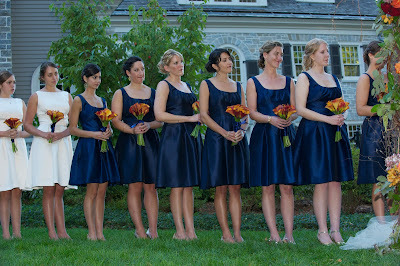 Maggie’s Bridesmaids looked stunning in navy blue, carrying their bouquets of burnt orange calla lilies down the aisle before the beautiful bride’s grand entrance. 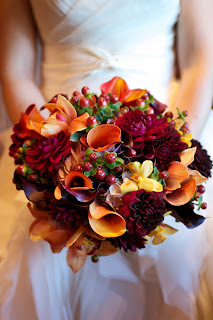 The Bride carried a lush bouquet of burgundy Dahlias, burnt orange Calla Lilies, Hypericum Berries, Cymbidium and Mokara Orchids. After the ceremony, guests were led over to the reception across the estate where a magnificent tent was set up. 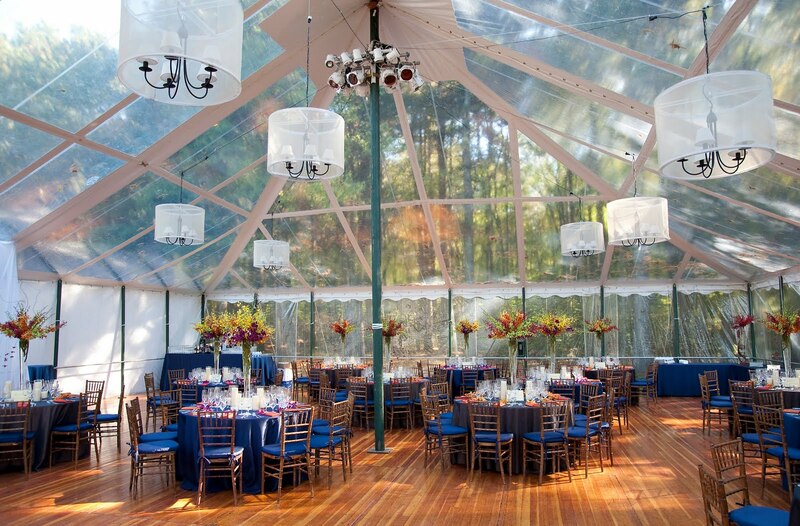 The clear material of the tent allowed the navy blue and orange colors of the linens and the lighting from the hanging chandeliers to glow through. Before entering, guests walked by a welcome table of Cymbidium Orchids and votives to set the scene. 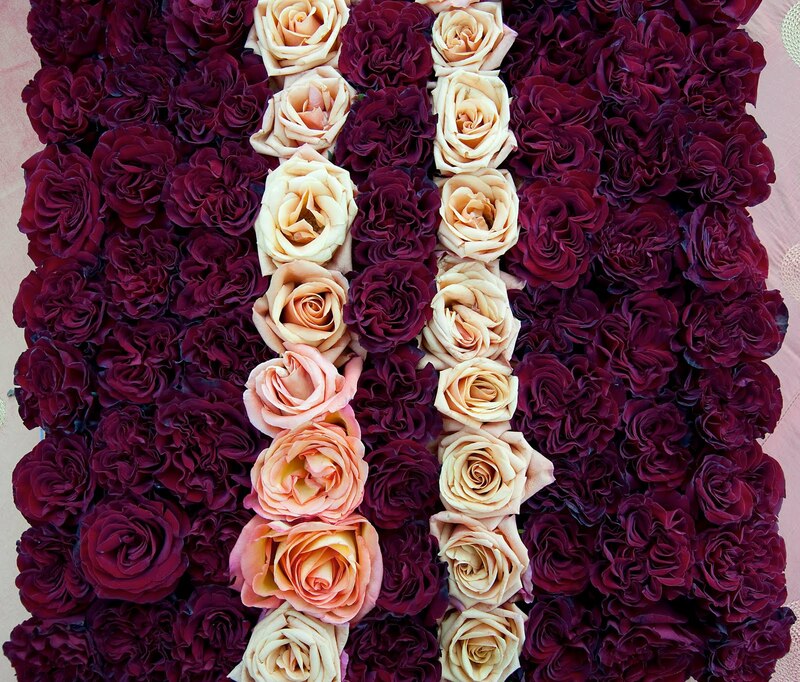 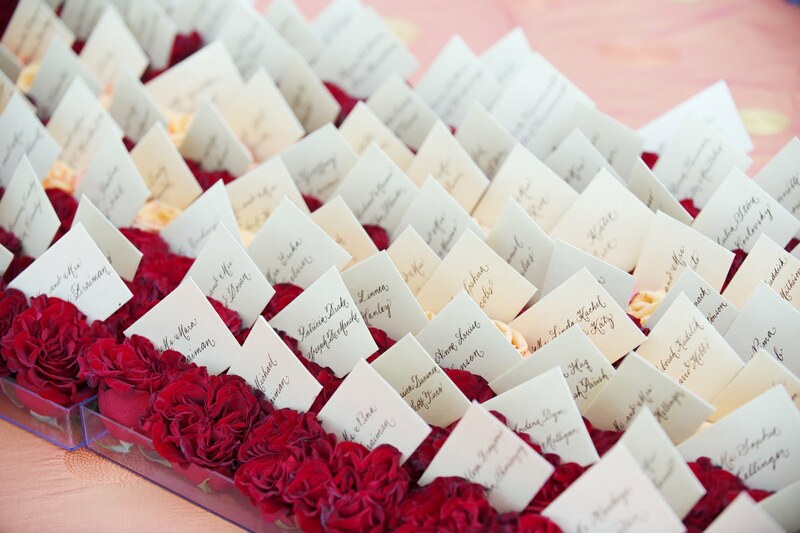 Once inside, place cards with each guest’s name appeared in elegant calligraphy all placed inside a flat display of Black Magic and light orange Roses. 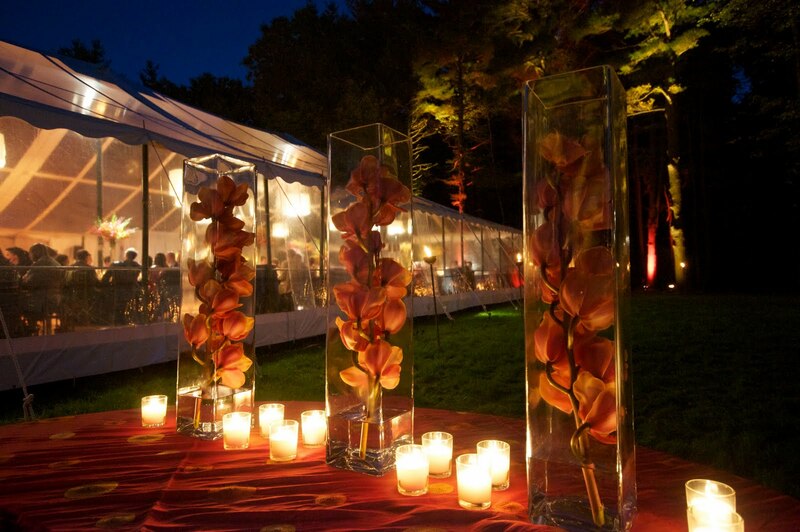 Once inside the clear tent, it was easy to see why the Bride and Groom has chosen this aesthetic, it allowed for the wedding to have all of the elegance and amenities of a ballroom, with custom designed chandelier lighting and hard wood floors especially constructed for the event. 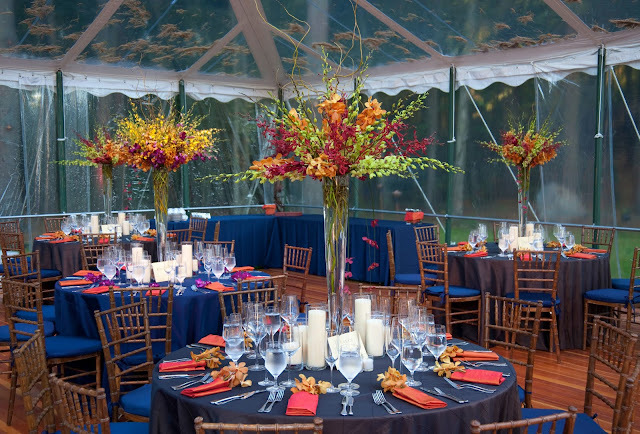 All this and still, it had the appeal of an outdoor wedding, with rolling hills of green lawn, tall trees of early Fall’s foliage, and a clear blue sky which lead to a star filled night sky. 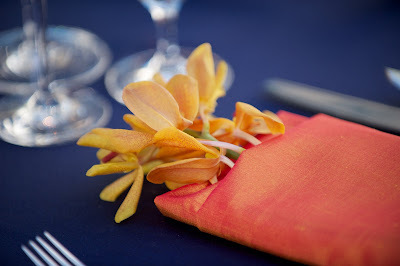 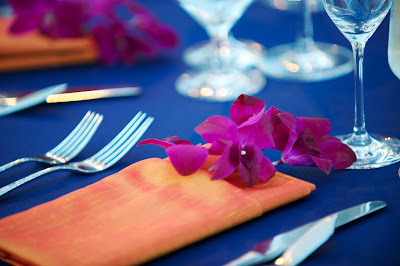 The tables and chairs were dressed in navy blue, with touches of color appearing throughout, like in the orange napkins with orange and purple Mokara and Dendrobium Orchids tucked inside at each place setting.. 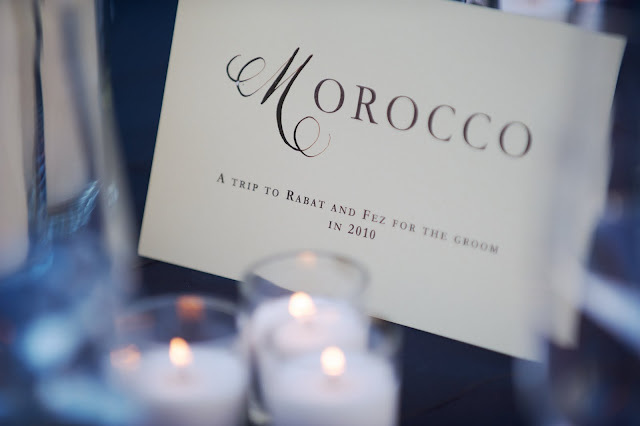 The details continued through the table design, as the Bride and Groom chose to number each of their table’s with a card describing a country they had traveled to in the past. 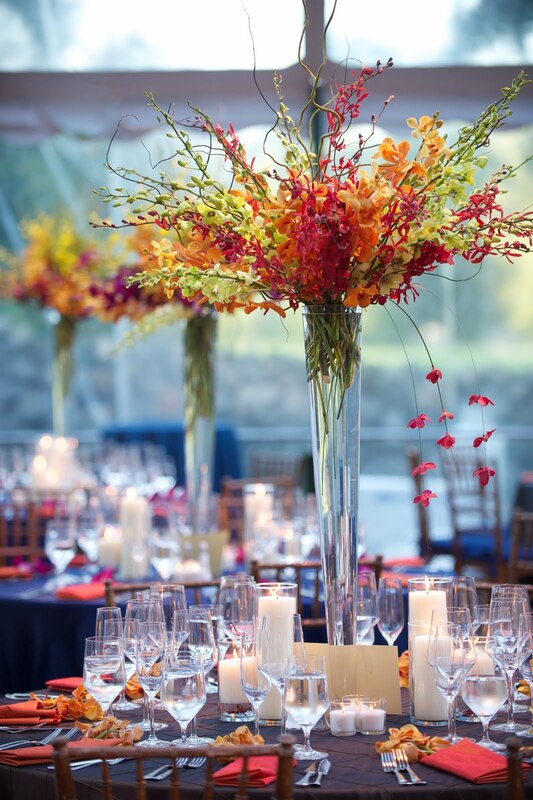 Candles of varying heights were placed around the center of the table as well, creating an ambiance for all of the seated guests. 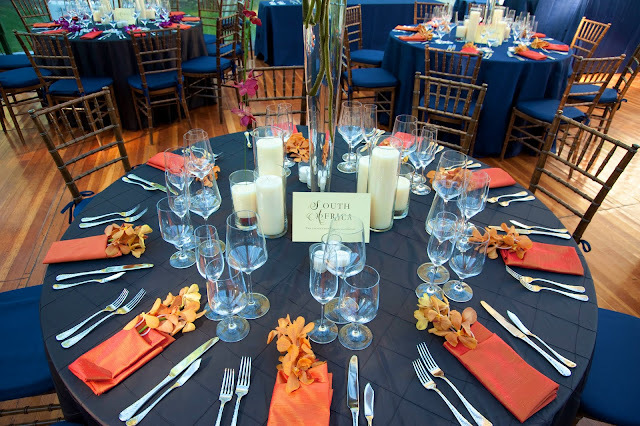 Creating the centerpieces for each table was a challenge in itself, being that they were all constructed completely on site! 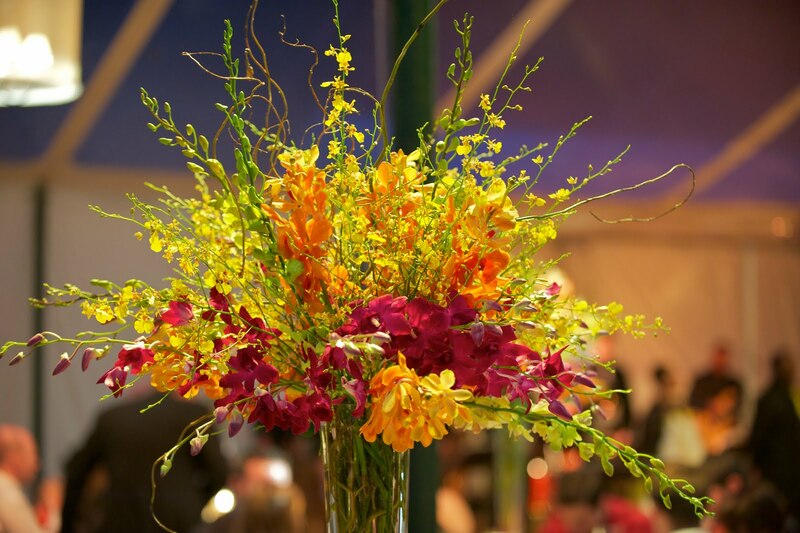 We used tall glass flutes and created a fan shape out of Mokara and Dendrobium Orchids, stems of Curly Willow, and blades of steel grass with small orchid florets attached. The end product looked amazing, and our talented team did a great job creating our vision the morning of the event! This wedding was an amazing, vibrant affair, and we are thrilled to have had the chance to work on it with the wonderful Bride and Groom. Best wishes and a lifetime of happiness to Maggie and Robert!